The Coastal Wetlands Planning, Protection, and Restoration Act has a great deal to be thankful for during this holiday season. 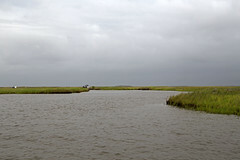 Since its inception, CWPPRA’s primary mission has been the betterment of Louisiana’s coastal wetlands. Currently, the net wetland area protected, created, or restored by CWPPRA is approximately 100,000 acres, with an additional 357,246 acres having been enhanced. CWPPRA greatly appreciates the support of the public, as well as the collaboration with the State of Louisiana and five partner agencies: the Department of the Army, Corps of Engineers; Environmental Protection Agency; Department of the Interior, Fish and Wildlife Service; Department of Agriculture, Natural Resources Conservation Service; and the Department of Commerce, National Ocean Atmospheric Administration, National Marine Fisheries Service. CWPPRA would like to wish everyone a Happy Thanksgiving!